Dale is a small village and community in Pembrokeshire, Wales, located on the peninsula which forms the northern side of the entrance to the Milford Haven Waterway. The village has 205 inhabitants according to the 2001 census, increasing to 225 at the 2011 Census. It was once a marcher borough, controlled by the Norman de Vale family from the 13th century Dale Castle. Owen, in 1603, described it as one of nine Pembrokeshire "boroughs in decay". Located in the hundred of Roose, it is part of Little England beyond Wales, and has been English-speaking since the 12th century. The name (Old Norse: Dalr = "valley") suggests prior occupation by Scandinavians.. The nearby RAF Dale airfield was active from 1941 to 1948. Following cessation of activities in World War II, RAF Dale was decommissioned, and the site became occupied by the Fleet Air Arm as RNAS Dale (HMS Goldcrest), a satellite of HMS Goldcrest at RNAS Brawdy. In 1485, Henry Tudor landed at Mill Bay near Dale prior to the Battle of Bosworth, after which he became King Henry VII. Villagers mark the anniversary—the most spectacular commemoration was for the 500th anniversary in 1985. On 15 February 1996, the oil tanker Sea Empress grounded at the Milford Haven entrance spilling 72,000 tonnes of crude oil. Dale Fort is a Victorian era fort located on a rocky promontory that now houses a field studies centre, for study of local marine biology, biology, geology, geomorphology, and other related fields. Dale is a local centre for sailing, and Windsurfing is taught in the Dale bay, along with sailing and boat handling courses. Dale is also often the location of sailing galas. The Pembrokeshire Coast Path passes through the village and around the Dale peninsula. The Dale Coronation Hall is used for many events in the community and is home to the D.A.D.S. (Dale Amateur Dramatic Society). The society performs a play, pantomime or sketch every year in March. The group is made up of villagers, friends and families from all around the peninsula who come together to sing, dance and perform. The 2011 census showed 5.9% of the population could speak Welsh, a fall from 11.0% in 2001. ^ "Community population 2011". Retrieved 21 April 2015. ^ Laws, Edward (1888). The History of Little England Beyond Wales (PDF). Bell, London. p. 223. Retrieved 21 January 2019. Pembrokeshire is a county in the southwest of Wales. It is bordered by Carmarthenshire to the east, Ceredigion to the northeast, and the sea everywhere else. Fishguard is a coastal town in Pembrokeshire, Wales, with a population of 3,419 recorded in the 2011 Census. The community of Fishguard and Goodwick had a population of 5,043 in 2001 and 5,407 in 2011. Modern Fishguard consists of two parts; Lower Fishguard and the "Main Town". Fishguard and Goodwick are twin towns with a joint Town Council. Milford Haven is a town and community in Pembrokeshire, Wales. It is situated on the north side of the Milford Haven Waterway, an estuary forming a natural harbour that has been used as a port since the Middle Ages. Founded in 1790 by Sir William Hamilton, designed to a grid pattern, it was originally intended to be a whaling centre, though by 1800 it was developing as a Royal Navy dockyard which it remained until the dockyard was transferred to Pembroke in 1814. It then became a commercial dock, with the focus moving in the 1960s, after the construction of an oil refinery built by Esso, to logistics for fuel oil and liquid gas. By 2010, the town's port had become the fourth largest in the United Kingdom in terms of tonnage, and continues its important role in the United Kingdom's energy sector with several oil refineries and one of the biggest LNG terminals in the world. St Dogmaels is a village, parish and community in Pembrokeshire, Wales, on the estuary of the River Teifi, a mile downstream from the town of Cardigan in neighbouring Ceredigion. A little to the north of the village, further along the estuary, lies Poppit Sands beach. The parish includes the small settlement of Cippyn, south of Cemaes Head. 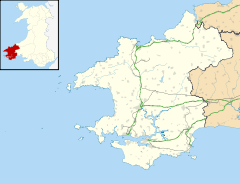 Wiston is a village, parish and community in Pembrokeshire, Wales, in the United Kingdom. It was once a marcher borough. Owen, in 1603, described it as one of nine Pembrokeshire "boroughs in decay". It continued as a constituent parliamentary borough until the end of the 19th century. Milford Haven Waterway is a natural harbour in Pembrokeshire, Wales. The Haven is a ria or drowned valley flooded at the end of the last Ice Age. The Daugleddau estuary winds west to the sea. As one of the deepest natural harbours in the world, it is a busy shipping channel, trafficked by ferries from Pembroke Dock to Ireland, oil tankers and pleasure craft. Admiral Horatio Nelson, visiting the harbour with the Hamiltons, described it as the next best natural harbour to Trincomalee in Sri Lanka and "the finest port in Christendom". Llawhaden is a village and community in the Hundred of Dungleddy, Pembrokeshire, West Wales. The community of Llawhaden includes the parish of Robeston Wathen, part of Narberth and the hamlet of Gelli, and had a population of 634 in 2001, increasing to 688 at the 2011 Census. Angle is a village, parish and community on the southern side of the entrance to the Milford Haven Waterway in Pembrokeshire, Wales. It has a school, two pubs, a village shop with a post office and St Mary's church. There is a bus link to Pembroke railway station. Rosemarket is a village, parish and community in Pembrokeshire, Wales, north of Milford Haven. St Ishmaels or St Ishmael's is a village, parish and community close to the harbour of Milford Haven in Pembrokeshire, Wales. The community comprises most of the parish of St Ishmaels and had a population of 490 at the 2001 census. The ward includes the communities of Herbrandston, Dale and Marloes and St. Brides. The community was subsequently merged with other communities and only the ward remained with the name St Ishmael's. This covers the entire peninsula with at total population at the 2011 census of 1,405. Thorne Island is a rocky islet, part of the community of Angle, Pembrokeshire, Wales. It has an area of 2-acre (8,100 m2). The island is dominated by a coastal artillery fort that was built to defend the Milford Haven Waterway in the mid-19th century. It has been the site of a number of shipwrecks, including one in 1894 that was carrying a cargo of Scotch whisky. Royal Air Force Angle, or RAF Angle, is a former Royal Air Force station. Located on the Angle Peninsula Coast, 8 miles (13 km) west of Pembroke, Pembrokeshire, Wales, it was operational from 1 December 1941 to the 1950s, having been used by both the Royal Air Force (RAF) and the Royal Navy. Royal Naval Air Station Dale or more simply as RNAS Dale is a former Fleet Air Arm base located 6.5 miles (10.5 km) west of Milford Haven, Pembrokeshire, Wales. Lawrenny is a village and parish in the community council ward of Martletwy, in the county of Pembrokeshire, Wales. It is on a peninsula of the Cleddau estuary upriver from Milford Haven where it branches off towards the Cresswell and Carew Rivers and is in the Pembrokeshire Coast National Park. Hubberston is a coastal village in Pembrokeshire, Wales. It belongs to the parish of Hubberston in the historical hundred of Roose. It is located directly to the west of the larger town of Milford Haven, and is a district of the community of Milford Haven. It is adjacent to the village of Hakin. It had a population of 2,390 inhabitants in 2001. It is mainly residential in nature. Herbrandston is a village and community on the north side of the River Cleddau, in Pembrokeshire, Wales. It is located to the west of Milford Haven and Hakin and east of St Ishmael's. Before 1960 and the building of the ESSO oil refinery, the village only had a population of 200; as infrastructure grew, so did the population. The size of the village increased within a matter of years, as housing estates associated with the refinery were built. The village has a population of 397, 15% of which is Welsh-speaking. The Angle Peninsula Coast is a peninsula which forms the southern side of the entrance to the Milford Haven Waterway in the county of Pembrokeshire, Wales. It is a Site of Special Scientific Interest. There is a wide range of wildlife and a former RAF airfield. Cawdor Barracks is a British Army installation located 6.3 miles (10.1 km) east of St Davids, Pembrokeshire and 9.8 miles (15.8 km) south west of Fishguard, Pembrokeshire, Wales.